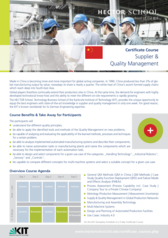 In Suzhou / China: The Certficate Course provides engineering professionals with state-of-the art technology and management expertise taught on-site in China. "Made in China" is becoming more and more important for global acting companies. In 1990, China produced less than 3% of global manufacturing output by value; nowadays its share is nearly a quarter. The white heat of China‘s ascent formed supply chains which reach deep into South-East Asia. Global players therefore continually extend their production sites in China. Parallely, the demand for engineers with highly developed technological know-how and the ability to meet the different on-site requirements is rapidly growing. The HECTOR School, Technology Business School of the Karlsruhe Institute of Technology (KIT), provides the unique opportunity to equip the best engineers with state-of-the-art knowledge in supplier development & quality management in only one week. For good reason, the KIT is known worldwide for its German Engineering expertise. The seminar week is composed of compact knowledge transfer in lectures, case studies, as well as excursions and company tours. The latter will provide participants with profound insights into the practical implementations in a Chinese production environment. The course does not only provide state-of-the-art knowledge transfer on-site, but also allows useful exchange with professionals and executives working in China. Production Science (wbk) at the KIT. She holds the Professorship Production System and Quality Management. From 2008-11 she had been holding the Shared Professorship Global Production Engineering and Quality of the KIT, which offered her the opportunity to work with Daimler AG in the Department of Strategy Planning. Since 2009 she is Director of the Global Advanced Manufacturing Institute (GAMI) in PR China employing around 20 engineers. The course is bookable for a group of minimum 5 people and a maximum of 15 people. Costs are 3.500€ per participant (incl. lecture materials, all transfers, lunch breaks & social events). For individual scheduling of this 5-day certificate course especially for your company please contact our program consultants. Please ask us for special company and alumni rates!